Since I started writing for The Comics Herald I’ve learned a lot about comics, both in the way the proverbial sausage is made and how I tackle reviewing them. I’d like to think that I have grown into my own voice, and have moved away from simply stating the story beats, and actually delving into what they actually mean. Writing anything is always a work in progress, and writing for comics – admittedly an area which I have only truly begun to embrace in my formative years of being an adult – has taught me a lot about what I should and shouldn’t do. 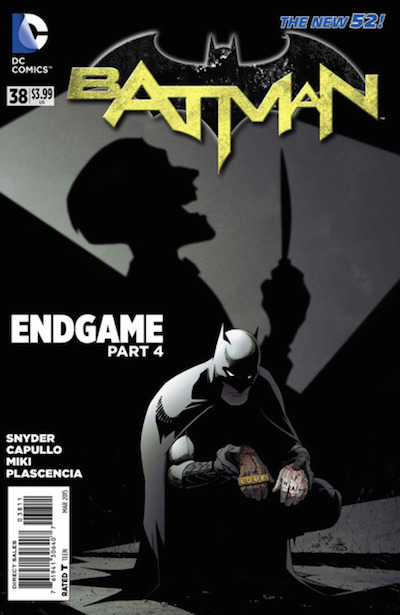 This week I discovered I have a tendency to make definitive statements that veer too much into the dramatic – see my final line of my Batman #13 review. Or the way I structured my review of the “Death of a Family” arc, and how I claimed that it was the greatest event ever to grace our shelves in modern comics (and that no one could tell me other wise goddammit!). I’ve learned to pare back such statements. I can’t tell you if this or that comic is a classic – it’s too soon after the fact to make bold remarks. But there is a problem when something so good rolls around. The monthly release schedule means that often I completely forget what happened in previous issues, and sometimes the weekly releases feel like a chore more than anything. But not Batman. I have never forgotten what has happened between issues, nor have I looked at the release once and gone “Maybe I can skip it this time.” Scott Snyder and Greg Capullo have constructed such a fantastic story, time and time again, that it is very hard not making big claims. And “Endgame”? You bet I’m going to burst a blood vessel trying not to. “Endgame” is dealing with something that hasn’t really been dealt with in recent memory – what would happen if the Joker stopped playing around? No longer seen as some kind of twisted friendship, Batman has finally become something that the Joker can no longer stand – someone he finally hates. This arc becomes somewhat of a second act to “Death of the Family”, where the Joker was acting out of some form of love by removing the things he viewed as making Batman weak. He is now plainly trying to remove Batman out of the equation forever. This Joker has become truly terrifying. Snyder and Capulo have capitalised on the fear people have for the Joker before, but not like this. This issue highlights how this arc has become a city wide horror story, where a legion of Joker zombies are hunting down Batman thanks to an airborne version of the Joker gas. The scenes echo classic zombie movie tropes and it is always fun to see Batman move through a story that feels more at home in the horror genre. Enough about mood and themes, lets talk about the two big developments this issue. Firstly, Batman’s investigation into the Joker suggests that he may belong to the same kind of villainy that Vandal Savage and Ra’s Al Ghul inhabit, and there may be historical evidence to back it up. This is a fascinating development, as it ties in brilliantly with the Joker over the years who should have died, but keeps bouncing back. The best part of this revelation is that in true Joker fashion, there really isn’t any definitive answer to that allegation – at least not yet. It echoes the multi-choice origin from the Killing Joke, and I think it would certainly add layers to the character if it was never substantiated. Secondly, and this is the big one, Batman turns to the Court of Owls for help in an incredible cliffhanger. This is brilliant as it ties together their run on Batman nicely. Too many comics seem to have an amnesia for whatever small events that preceded it, so it is refreshing for Snyder and Capullo to really make this story seem like it was built from the beginning. “Court of the Owls” was a fantastic visual showcase for Capullo, and I look forward to seeing what else he brings to the table in the remaining issues of “Endgame”. Like I said, I’m having a hard time trying not to gush over these turn of events. Really, all I can say is that I cannot wait for what happens next. February 25th cannot come soon enough.